1. One of Douglas Adams’s early jobs was as a bodyguard to a Qatari family of oil tycoons. He also had a job cleaning a chicken-shed at one point. The ‘eureka moment’ for The Hitchhiker’s Guide to the Galaxy came when he lay drunk in a field in Innsbruck, Austria in the early 1970s. At the time he was carrying a copy of The Hitchhiker’s Guide to Europe with him, and it occurred to him – as he looked up at the stars – that ‘somebody ought to write a Hitchhiker’s Guide to the Galaxy’. It took a few years for the idea to take shape, but in 1978 the radio programme made its debut. A trilogy – comprising, as trilogies don’t tend to, five books – followed. If you want to see an interview with a young Douglas Adams talking about the series, there is a great Youtube clip of Adams being interviewed on the television programme Nationwide in December 1980, when Adams was just 28. 2. He made two appearances in Monty Python’s Flying Circus. He also briefly wrote for the comedy show. In his first appearance, in November 1974 (the final series of the TV programme), he played a doctor; in his second appearance, he played a Pepperpot (a number of middle-aged matronly characters played by men). Adams went on to write for the TV series Doctor Who, becoming script editor in 1979. 3. He came up with the title of Pink Floyd’s 1994 album The Division Bell. In this archived page from Adams’s website from the late 1990s, he mentioned that he once played guitar with the band on stage. 4. He claimed he was the first person in the United Kingdom to buy an Apple Macintosh computer. His friend Stephen Fry claims to be the second person (though some sources say Fry bought the first, and Adams the second). In 1990, Adams wrote and presented a documentary, Hyperland, about the potential of hypertext. Later that year, Tim Berners-Lee, working at CERN in Switzerland, developed HTML (i.e. ‘HyperText Markup Language’) and the world-wide web was born. Adams was an early adopter of email, and had his own email address in the early 1980s when he was working on the video game version of Hitchhiker’s. 5. His ashes are in Highgate Cemetery, where numerous other writers and famous figures are buried and memorialised. Also in Highgate Cemetery, you’ll find George Eliot, Karl Marx, Herbert Spencer, Beryl Bainbridge, Christina Rossetti, Elizabeth Siddal, and Charles Dickens‘s wife and parents. Adams is also commemorated every year on 25 May, which is named Towel Day in his honour (a reference to Hitchhiker’s). On that day, fans of Adams’s work ‘around the universe’ proudly carry a towel with them. , without more ado. Oh, and a towel, while you’re at it. Discover more literary interestingness with our curious facts about classic science fiction. 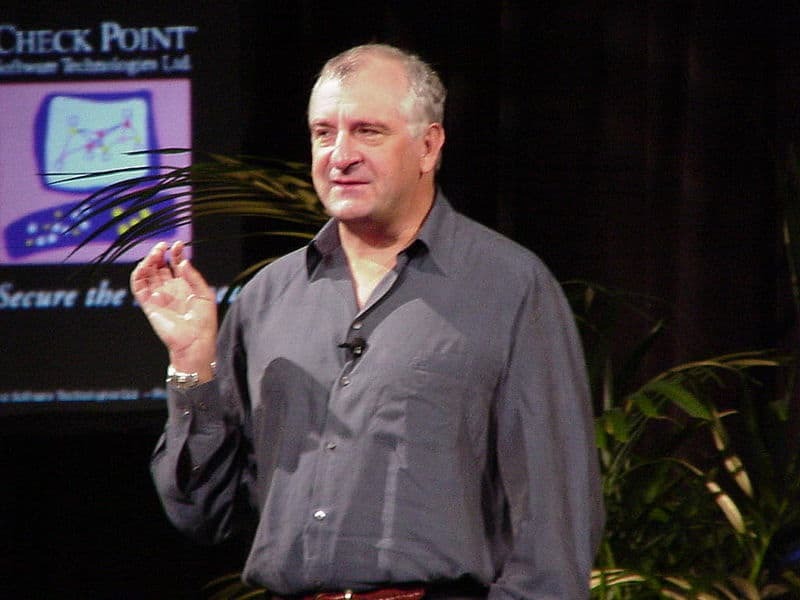 Image: Douglas Adams as a keynote speaker at Internet Security Conference in San Francisco, March 15-17, 2000, author John Johnson, Wikimedia Commons. Towel day, huh? I did not know. Better make a note of it in my diary. Such a wonderfully creative mind. I couldn’t have come up with a better list. Thank you Interesting Literature. Great list! Had to reblog this, giving you credit for a wonderful list. Some interesting facts about a really interesting man. One of my all time favorite series (The Hitchhikers Guide to the Galaxy)! Check out these fun stats on the author – Douglas Adams. What a wildly interesting guy! Happy Birthday Douglas…and thanks for all the fish. He was such an amazing man and creative thinker! Thank you for sharing this wonderful list! THHGTTG is my favorite book of all time. Love this! Douglas Adams is one of my writing heroes! I love Adams, but I didn’t know about towel day. I’m marking my calendar. Gossip will run amok on the 25th in a small Kansas town about the music teacher’s daughter and that towel she is toting about…. Jilanne: Well, as Adams once said, 42 is the funniest of the two-digit numbers (!). For more, one can see my *Philosophy and The Hitchhiker’s Guide to the Galaxy*, especially chapter 9, section 7. PS: ‘The “eureka moment” for The Hitchhiker’s Guide to the Galaxy came when he lay drunk in a field in Innsbruck, Austria in the early 1970s’: well, that’s what Adams – who loved a good story – said; but there is in fact some room for doubt. Indeed Adams himself confessed that he wasn’t sure it was true. See Simpson, *Hitchhiker: A Biography of Douglas Adams*, pp. 4, 91. Adams is one of my all-time favourite authors. He made my youth an hilarious time and I will be forever grateful to him for that. Wonderful facts about a great talent sorely missed. Always interesting and amusing, and this one funny in a sense. A body guard, get´s his eureka moment while drunk, and what´s up with all these good writers they all seem to have some type of problem with alcohol, so I guess I should become the next great writer. And the computer thing…that´s a battle between these two. Douglas Adams was truly an amazing person! He wrote both one of my favorite book “trilogies,” and one of my favorite TV shows! If I had to be a body guard (i.e. saying shoot me not the rich guy because you’ll feel much better when the law comes down on you) I’d want 42 to be the answer to what should I have for breakfast.